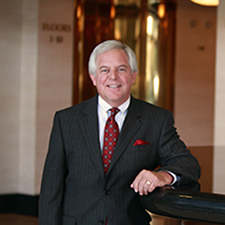 Ron Tritschler, who joined The Webb Companies in 1987, is a director, CEO and senior legal counsel. He is responsible for providing general corporate and real estate legal advice, personnel management, and oversight of the company’s leasing and financing activities relating to a broad range of real estate projects. He is on the board of trustees and a member of the Audit and Pricing Committees for the Unified Series Trust Mutual Funds, a compilation of 17 publicly traded mutual funds that are associated with Ultimus Funds Solutions. Ron is also on the board of directors and serves as vice chairman of the Directors’ Loan Committee, and member of the Audit and Personnel Committees of First State Financial, a bank holding company located in Kentucky. Additionally, he serves on the board of directors of Mountain Valley Insurance, an affiliate of First State Financial. Throughout his career, Ron has served on numerous professional and charitable organizations. He is a member of the Kentucky and Fayette County Bar Associations, Commerce Lexington, and formerly served as a board member and chairman of Blue Grass Tomorrow. He is the chairman of the Lexington Convention and Visitors’ Bureau and a member of its Finance Committee. He previously served in various positions including director for Three Papas, the Papa John’s franchisee for Russia; as a trustee and secretary of the board of Lexington Catholic High School; and as a member of the parish council of St. Elizabeth Ann Seton Church. Ron holds a bachelor’s degree in Business Administration from Baldwin-Wallace College in Berea, Ohio; a Juris Doctorate from the University of Toledo College of Law; and an MBA from the University of Toledo Graduate School of Business. Ron lives in Lexington with his wife and has two children.